From renowned translators Richard Pevear and Lindsay Volokhonsky comes a new translation—certain to become the definitive version—of the first great prison memoir, a fictionalized account of Fyodor Dostoevsky's life-changing penal servitude in Siberia. Sentenced to death for advocating socialism in 1849, Dostoevsky served a commuted sentence of four years of hard labor. The account he wrote afterward (sometimes translated as The House of the Dead) is filled with vivid details of brutal punishments, shocking conditions, and the psychological effects of the loss of freedom and hope but also of the feuds and betrayals, the moments of comedy, and the acts of kindness he observed. 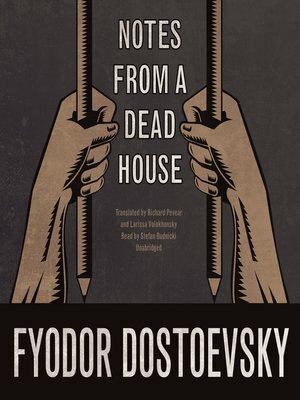 As a nobleman and a political prisoner, Dostoevsky was despised by most of his fellow convicts, and his first-person narrator—a nobleman who has killed his wife—experiences a similar struggle to adapt. He also undergoes a transformation over the course of his ordeal, as he discovers that even among the most debased criminals there are strong and beautiful souls. Notes from a Dead House reveals the prison as a tragedy both for the inmates and for Russia. It endures as a monumental meditation on freedom. Larissa Volokhonsky was born in Leningrad. She has translated works by the prominent Orthodox theologians Alexander Schmemann and John Meyendorff into Russian.